The foreign secretaries from more than 90 countries will converge on the State Department today for the Obama administration’s third and final summit on the health of the world’s oceans. The Our Ocean summit will focus on the nexus of climate change and ocean issues—a link U.S. Special Envoy for Climate Change Jonathan Pershing told reporters yesterday is not well-understood. “While climate change is a huge issue, in many ways we should think about it as an exacerbating factor for things that are already problematic,” said Pershing. The world’s oceans are already threatened by overfishing and pollution from industry and agriculture. But they have also absorbed 40 percent of the man-made carbon dioxide that has entered Earth’s atmosphere since the Industrial Revolution, leading to higher levels of acidification that have damaged coral reefs and shellfish populations. The seas have also absorbed heat, sometimes causing fisheries to migrate out of their traditional range and away from fishermen that rely on them. Secretary of State John Kerry launched the summit two years ago to shine a light on what he considers to be the foreign policy and national security priorities related to oceans management. Last year’s gathering was hosted by Chile. Kerry will open the conference today, with President Obama giving a keynote address in the morning. 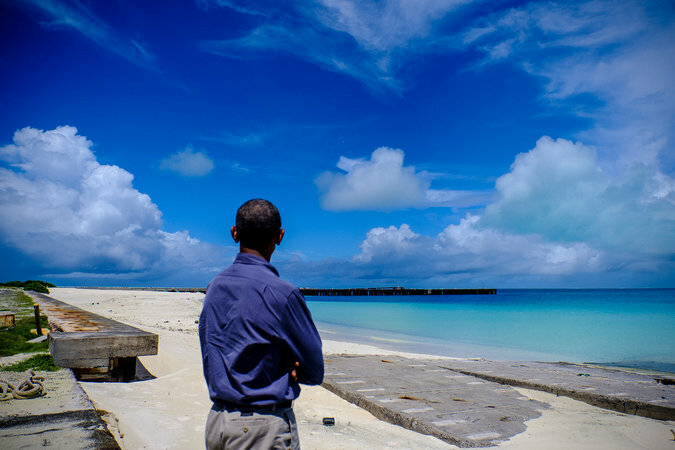 President Obama visited Turtle Beach on Midway Atoll in the Pacific this month to promote his expansion of the Papahanaumokuakea Marine National Monument. On Thursday, the president declared a marine monument in the Atlantic that is the size of Connecticut. The two-day summit at State Department headquarters will include more than 100 new commitments by a variety of stakeholders, organizers said. They include new marine protected zones and a proposed ban on disposable plastic bags put forward by France. Countries will also discuss ways to incorporate ocean health issues into the commitments they made in last year’s Paris climate agreement. Undersecretary of State for Economic Growth, Energy and the Environment Catherine Novelli told reporters yesterday that one way to compensate for the stress being placed on marine environments by climate change is to remove other pressures on the system, by scaling back pollution and creating more marine protected areas. Countries around the world have introduced protected areas in recent years, and “we’re going to have many more that will be announced at this conference,” she said. “We’re trying to lead by example in doing that.” Obama last month expanded the Papahnaumokukea marine protected area in Hawaii, making it the world’s largest ecologically protected area. And yesterday, the White House announced the designation of another marine national monument off the coast of Cape Cod in Massachusetts that will protect an additional 4,913 square miles. It will preclude activities like commercial fishing and deep-sea mining. A small number of lobstermen and red crab fishermen operate in the area, though the White House claimed it had not included the most active areas in the monument. Republicans say the administration has prioritized environmental aims over economic development. House Natural Resources Chairman Rob Bishop (R-Utah) described the Hawaii designation as “a sweeping expansion” in an op-ed in The Hill yesterday. In addition to protecting ocean ecosystems, these sanctuaries boost the role oceans can play in regulating the climate by contributing to the health of marine vegetation that sequesters carbon, Novelli said. Mangrove forests do more to sequester carbon than rainforests. “We know that the ocean is in trouble, but we also know that the ocean is resilient,” she said. International climate leaders and technical experts met yesterday at National Geographic’s headquarters to begin work on recommendations for how countries can integrate ocean concerns into their nationally determined contributions (NDCs) to the Paris Agreement. A handful of countries already refer to ocean issues in their submissions, but most don’t. Climate advocates hope the summit can help persuade countries to increase the ambition of their commitments early. The Moroccan presidency of the next round of climate talks in Marrakech has designated an Oceans Day during the November conference. The recommendations will be introduced then. French Ambassador Laurence Tubiana and Moroccan Ambassador Hakima El Haite, who together lead the Global Climate Action Agenda heading into this year’s talks, said they hope that businesses, cities and other non-state actors will make voluntary commitments to reduce the impact of climate change on the seas. El Haite said oceans should be “put in the heart of the development and human rights agenda” of Paris, including both mitigation and adaptation plans. “Including oceans in NDCs would be a clear political signal and commitment and would encourage more programs and initiatives from the private sector, the financial community and all the non-state actors,” she said. In addition to increased acidification and changing ecosystems, climate change is projected to contribute as much as 4 feet to sea-level rise by the end of the century. Solutions to both climate change and ocean ecosystem degradation include protection of mangrove forests and other so-called “blue sinks” that sequester carbon, better monitoring and investments in research, and the speedy implementation of Paris. The global climate deal takes effect when 55 countries totaling 55 percent of the world’s emissions join. The current tally is 27 countries totaling 40 percent of emissions. But more than 30 additional countries are expected to become parties next week at a Sept. 21 summit at U.N. headquarters in New York City. A global oceans summit that draws foreign ministers rather than environmental secretaries is part of Kerry’s legacy at State. “I have had this enormous love and respect for what the ocean means to us,” he said then. He continued to focus on ocean issues as a member of the Senate Commerce, Science and Transportation Committee and chairman of its Oceans, Atmosphere, Fisheries and Coast Guard Subcommittee. Pershing said on yesterday’s call that during his recent trip to Senegal, he was told that fisheries supplying 90 percent of that country’s protein are migrating out of reach of its fishermen as the ocean warms. “And if you start to think about that magnified by the extent of those coastal nations, which, in many poor countries, rely on their fishing capacity to provide a substantial share of their people’s food supply, you get one window into the extent of the damages,” he said. Tubiana, who was one of the architects of last year’s climate deal, pointed to the summit as another part of Obama’s legacy. “I think all of us will have a big debt to President Obama and his legacy, on his capacity to really have focused the global agenda to these key issues and make the link,” she said. “I think he’s using his last days and even the last minute to do that. “Whatever the result of your election is, you will have provided an enormous advance in the global agenda,” she said. Europe will host next year’s summit, and countries in other regions are lined up to do so in coming years—so its continued existence does not depend on who wins the U.S. presidential election. But if Republican presidential nominee Donald Trump wins the election, it is likely he’ll be less invested in climate issues, both domestically and internationally. But Pershing said on the call that international momentum would continue on climate change regardless of the outcome. Escalating damage from climate change and cheaper low-carbon solutions will continue to drive progress, he said.